Ohio State Football Ticket Prices Are Skyrocketing. Here's Why. Expectations for Ohio State football were soaring heading into the 1904 season. The university athletic association even commissioned the installation of 1,500 extra bleacher seats on the east side of Ohio Field (for you youngsters - today that's the sidewalk across High Street from Buckeye Donuts) to accommodate all of the freshly-minted bandwagoners they were sure would pile onto campus to see the best Buckeye team yet. It turns out a 6-5 team with zero tradition doesn't exactly set the demand curve on fire, and that's what happened 110 seasons ago. Ohio State's soaring expectations went unmet, those extra fans never showed up and the new bleachers stood empty for the majority of that disappointing five-loss season. Coach Edwin Sweetland lasted one more year in Columbus before skipping town to help some guy named Pop Warner run his football team at Cornell. The university had priced tickets for that overhyped 1904 season in tiers: A "regular" game entry would cost fans a quarter while the two "deluxe" games (against the Michigan Wolverines and, yeah you guessed it, the Carlisle Indians) would run four times as much. I looked it up so you wouldn't have to: That precious dollar in 1904 is worth about $23 today, which would still be $127 short of face value for a single Ohio State-Michigan ticket this November. Yes, tickets to The Game in 2014 cost $150 apiece. 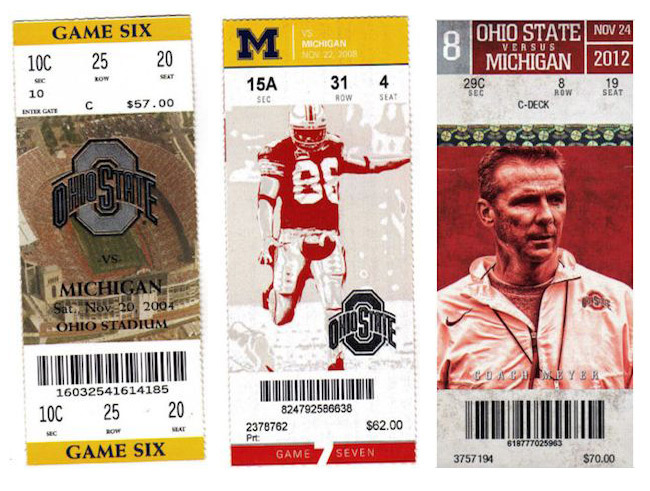 The last two times Ohio State hosted Michigan in 2010 and 2012 that same ticket cost $70. Even with inflation, you could have attended both of those games combined for less than it costs this year. So why did the university abruptly jack up the price? The optics for a hike like this are terrible. They know this, but they did it anyway. Back in 2012 Ohio State brought in a consulting firm to conduct a pricing study to determine if it was maximizing its ticket revenues. The firm took the secondary market (Ohio State has a contract with Ticketmaster, so it already gets a significant piece of it) as well as scalpers into consideration. The firm's recommendation was to raise ticket prices on what is already the highest face value college football ticket in the country. It's not just 2013 and 2014 ticket prices that are jumping, either; your can expect your ticket to The Game in 2016 to cost $175 if not more. Those consultants also suggested Ohio State increase the annual ante for its President's Club ($2,500) and Buckeye Club ($1,500) donation minimums, either of which grants the donor the right to purchase season tickets. You may think these hikes price out the average fan from buying football tickets and going to games, and you would be wrong, because only suckers pay retail. Average fans don't have to be wealthy to join Buckeye Club - or even President's Club - every year in order to buy the right to buy tickets. Average fans simply need to understand how to compliantly pass their costs for enjoying Ohio State football onto someone else. In most cases, that someone is going to be the US Treasury. First, that Buckeye Club/President's Club ante - the IRS has a nice little rule specifically for university donations that are made in order to buy the right to purchase tickets: You can deduct 80% of that donation from your taxes every year. This means joining the Scarlet & Gray level of Buckeye Club - which at $1,500 gets you the right to buy two tickets - gives you a $1,200 tax deduction. Oh, you need a stadium parking pass too? That requires a $3,000 gift, which knocks $2,400 off your income. fans simply need to understand how to compliantly pass their costs for enjoying Ohio State football onto someone else. If you would like to travel with the team, get field passes, have cocktails with Gene Smith and gain all of the other perks that come with OSU's Super Creepy All-America level donation tier, that $25,000 gift gifts you a $20,000 tax break. This is uncapped, provided your donations aren't more than half of your Adjusted Gross Income, which for the vast majority of Americans who bother to file returns is over $50,000 annually. That's the average fan. So if you can endure the angst of writing a big check to Ohio State by simply remembering you'll be getting 80% of it back in tax breaks once you show the IRS your fancy Buckeye Club sticker. That's only the beginning: You can get even more of your football investment covered. Once you become a President's Club member you will need to actually buy the tickets. You, being a person...or a corporation, since the United States has laws about corporate personhood that extend to businesses numerous rights and recognitions afforded to individuals. So just incorporate yourself. Provide consulting, freelance in the trade of your choosing or even start a blog (wink) and you've got nice catalyst for incorporating. As you are probably aware, corporations buy up a lot of tickets - not only because they have the capital to do so but because college football games can become business expenses when you're a business. If you're in sales, already own a business or run a little side enterprise, terrific - you are already in great shape to use your Buckeye football tickets as a legitimate business expense (provided your business is both legitimate and legal, with sincere apologies to you self-taught unregistered pharmacists and/or distributors). Your keys to Ohio Stadium's gates are tucked into the law, the tax code and accepted, legal business practices - all of which are legal. Short of being a minor, in a lousy financial situation or both - getting Ohio State tickets isn't a terribly difficult or expensive task no matter what the university charges. Ohio State's consultants probably discovered the university could inflate the price tags on both its donation minimums as well as all tickets - especially the big tickets - without suffering a significant shortfall in paid attendance. Note that italicized word - it's a finance decision, not a football one, and it's rooted in how college sports enthusiasts can or already do pay for their game day habits. As long as there continue to be easy and legal ways for passing along the costs of enjoying college football to the Federal government the acquisition price isn't all that important. Asking for discounts for games against lesser opponents is a naive position, as Ohio State is not in the business of helping its football consumers save money. Only the spring game - an event with a purpose that does not intersect with Ohio State's financial goals - can be given away or put on clearance. Your keys to Ohio Stadium are tucked into the law, the tax code and ACCEPTED, LEGAL business practices. It does not matter if FAMU-caliber game tickets barely go for $10 on the street. It also does not matter if Michigan stinks again and the guys on bicycles circling Lane Ave at Olentangy have to unload their tickets for only $90 or even $75. That's not the university's problem, especially since mechanisms are in place to make doing business with Ohio State both secure and financially palatable. Those unmet expectations of 110 years ago that left the brand new east bleachers of Ohio Field empty don't matter nearly as much today as they did back then. Not in Ohio Stadium, not with Buckeye football now implanted in the state's DNA, not in the Columbus business community and definitely not with our tax laws. The product doesn't even have to be flawless; it simply needs to be good enough (this is a financial declaration, not a football one - or my opinion). Ohio State will get its larger cut with the very first ticket transaction as well as with all of those lucrative pre-transactions and many of the secondary ones. What happens beyond that - the opponent, the scalping, the weather that day, even the team's record - is inconsequential since the university gets paid first. So there truly is zero waste in Ohio Stadium. We've come a long way since 1904.